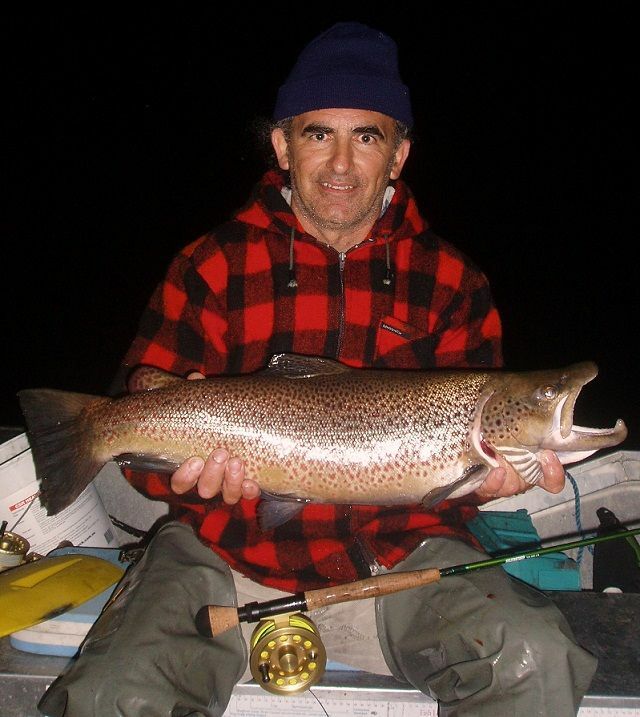 Rivers:- Not a great deal of change in the river fishing which has still been excellent. few repots of browns moving up but not to many now there has been some snow falling this will bring the browns on so be ready for a good run of fish going thought for the spawning season.The Thredbo and Eucumbene have both been fishing well.we had a few reports of fisherman useing two Nymphs and picking up some good fish. Nymphs will really come into their own over the next few weeks in the lower reaches of the Thredbo and Eucumbene. Black and Brown Nymphs are the pick of the flies. With the Spawn run not too far away any rain in these areas will see fish starting to build in the river mouth areas too. best areas to fish are close to the mouth off the lakes don't be scared to use glowbugs now is the time trailing with a Nymph black or brown. 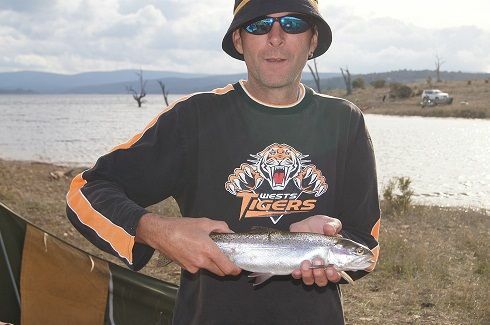 Lake Eucumbene:- Some very nice rainbows coming in over the last few weeks. The rainbows seem to come in for that hour on dusk chasing mudeyes . 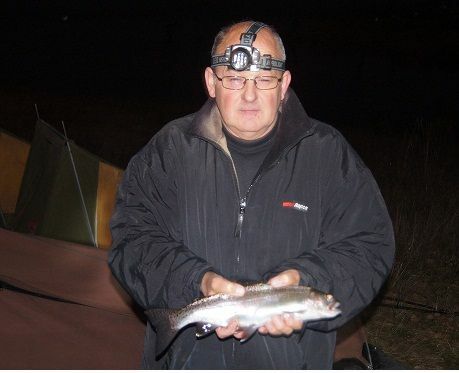 The rising lake levels have really got the Mudeyes moving, so fishing a woolly worm or mark2 woolly Bugger into the night may find you a better brown.fishing Rushys into the night has been good useing woolly worms Black/red are pick up some good rainbows as is seven gates and Yens. the better catches have been with the bubble float and the Mudeye but remember mudeyes are hard to get now so if you can get them they will pick up most of the fish.There have been some good hatches this week and the fish are well and truly on them. The last hour or two of daylight have been the best but you will get fish right through the day. A mudeye under a bubble is the best way and greasing your line to float is a definite advantage. You do need to keep an eye on your float at all times as the fish can sometimes be very subtle in their takes. 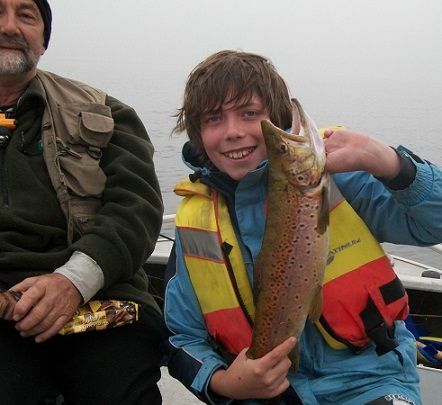 Tassies in, Y05, Y48, Y90, 26, 28, 46, Y36, 89, 04 and most of the new Tassie are getting some good fish. and any of the yellow wing patterns have been excellent S12 is working well. Dual Depth versions are a good option for getting down a fraction deeper. 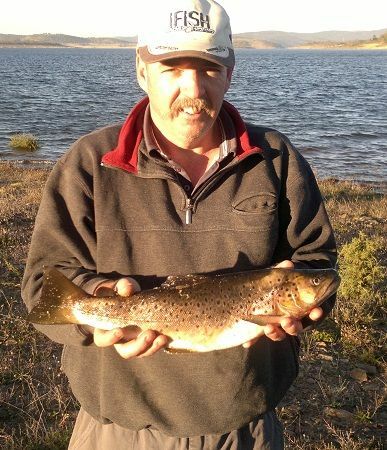 I went camping with my son at Eucumbene on the Providence arm and caught some great fish, including this 10 pound Brown Trout just before Easter. Lucky I took your advice and went to Rushy last night. 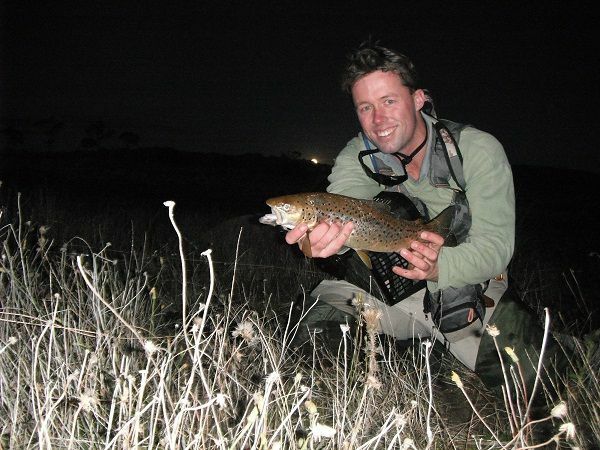 I experienced my first Eucumbene midge hatch in the corner of a shallow bay. Landed 4 fish and pulled the hooks on another 5 (I had to be a bit heavy as I was in amongst the thistles). I used the old trap door teqhnique with a midge pupa 30cm below a midge ball with most of the solid hookups coming on the midge ball. The brown took a midge ball right on dark and went just shy of 3lbs. Ended up bagging out on two out of the two and a half days fishing with Friday being dead (just 1 small brown). Hi guys,me,my dad Col,Gaz and Dan fished Cemetery Point area for some great rainbows.Sherbert Burst in low light and anything with green/yellow gulp during bright times.All were rainbows,no browns at all.11 on powerbait,1 on a worm!Weather was pretty good on Thursday and Friday nights,a bit windy at times. 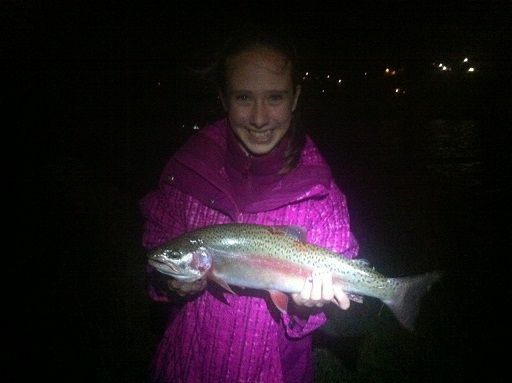 Just thought I’d send a picture of my daughter who bagged this 47cm rainbow off the bank at Buckenderra on Good Friday using chunky cheese power bait. As you can see she was very happy with her catch and it made for a good meal. We ended up with only 5 fish for the weekend and on all different baits including Mudeye, orange and chucky cheese power bait; some on floats and others with bottom sinkers. So unfortunately we can’t be any help for others giving it a go as nothing was better than anything else. 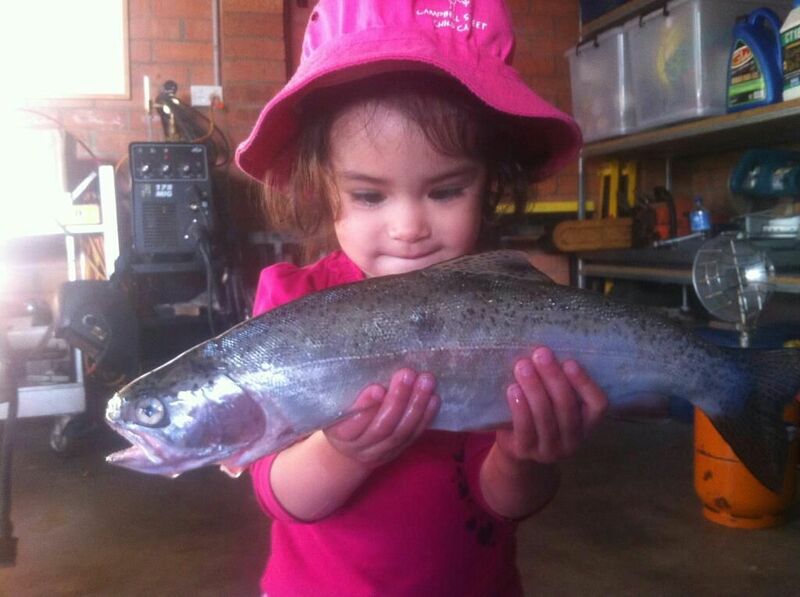 We had a great weekend taking our nearly two year old on her second fishing trip. She had a blast and loves fishing much to her proud parents delight. 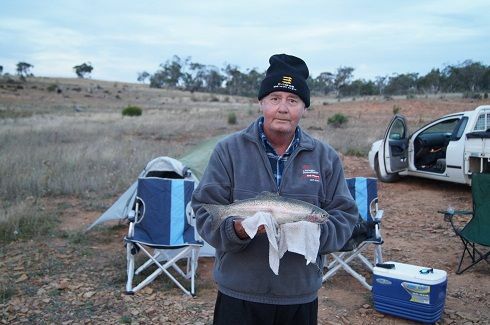 We caught around 23 various sized rainbow trout on Tassie Devils and power bait off the bank overnight at Seven Gates.